Dance Moves Earned Melissa Jo Zambrana '16 a Place on the 4th of July Episode of "Live with Kelly"
Melissa Jo Zambrana '16 was never one to shy away from an opportunity to be on stage in her time on campus. During her sophomore year, for example, she decided to perform a solo act at Lip Sync—she didn’t win but people enjoyed her performance so much that she was invited to host the event the following semester. She could also be found, she said, "dancing at Punch's Alley every Thursday on Pub Night" and she danced her way through the Class of 2017’s orientation as one of their Student Orientation Coordinators. "Since leaving Wellesley, my moves have been noticed," she reported. 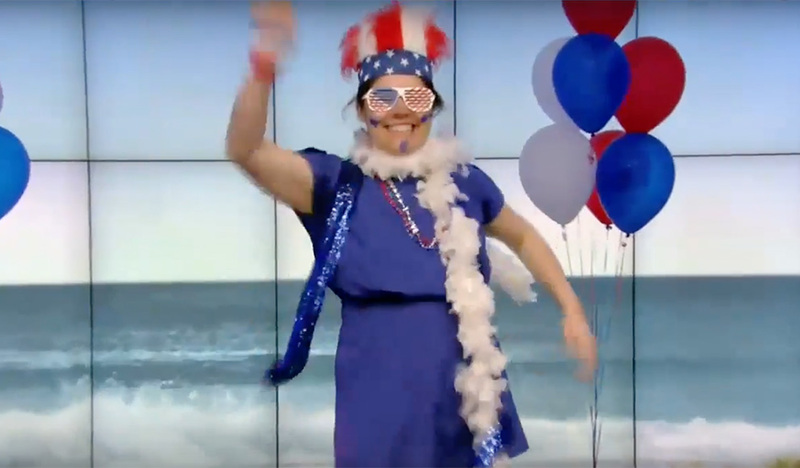 Zambrana went to a filming of the television show Live with Kelly and made it through three audition rounds to earn a place on the show’s 4th of July episode Trivia Dancer Dance-Off. For the contest, Zambrana explained, "I had two competitors and each of us was paired with a celebrity. I was paired with that day's co-host, Cedric the Entertainer. He had one minute to dress me and give me advice on how to perform and then I was on my own." Kelly Ripa introduced the dancers one by one, then they began to dance—and dance they did! Zambrana gave it her all, displaying twirls and high kicks and splits. "I used everything I had learned during my time at Wellesley and gave everything I had," she said. We won't give away the final results, but let's just say that Zambrana did Wellesley proud...and that she may have a future in informal television dance competitions. Watch the episode (the dance contest starts at around the 6:30 mark).